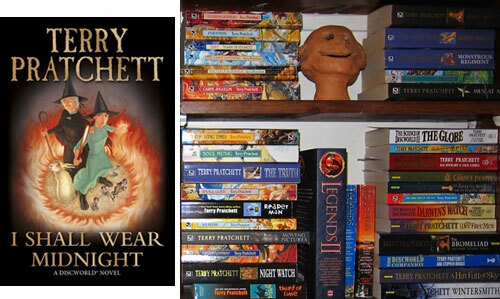 Terry Pratchett has been my favourite author since childhood and I’ve bought almost all of his books over the years as you can see by the partial photo of my bookshelf below. I recently finished reading the review copy of his new book I Shall Wear Midnight sent to me by his publishers. Darker and not as funny as other books in the series, moments of laughter were rare, like rays of sunlight through a bank of stormclouds. This is not to say that the book isn’t good, it was just more sombre than usual. The ending felt final, both in terms of finishing the Tiffany Aching series and since Pratchett has Alzheimer’s which means it could be his last book. If his health remains steady rather than deteriorating he plans to write another 2 books titled Snuff and Raising Taxes respectively. His initial books in the Discworld series were fun satirical fantasy novels but over time his writing matured and added fascinating studies into the dark and light aspects of human behavior to the mix. Pratchett uses his (Disc)world to hold up a distorting mirror to our world, providing a satirical perspective in novels which have ranged over xenophobia, militarism, rock ‘n’ roll, quantum physics, religion, the industrial revolution and opera! He has given readers versions of Homer and Dante (Eric), Shakespeare (Wyrd Sisters and Lords and Ladies), The Phantom of the Opera (Maskerade), and pop music (Soul Music). In Moving Pictures Pratchett parodies celebrity culture and Hollywood films, Small Gods tackled religious fundamentalism, Going Postal showed the dark side of venture capitalism and Thud! how conflicting ethnic cultures can hold grudges for centuries based on a false premise. A word about Pratchett for the uninitiated. Terry Pratchett is an incredibly funny, warmly human British fantasy (mostly) novelist. He writes at an impossible rate. Most of his books are part of a sprawling, infinitely varied fantasy series called Discworld, about a flat, disc-shaped planet that is carried on the backs of four gigantic elephants who tramp in slow circles around the back of a vast, interstellar turtle called A’Tuin. On Discworld, everything happens. There are imperial battles and barbarians; witches and trolls and dwarves in the hills; animist spirits on lost continents; and there is a vast and wonderful and terrible city called Ankh-Morpork. Ankh-Morpork is presided over by a tyrant called Lord Vetinari, who is quite progressive as tyrants go. For one thing, he’s let the trolls, vampires, medusae, dwarves, werewolves, zombies, and assorted other nonhumans into the city. For another, he’s organized the thieves into a guild to whom one can pay an annual license and be guaranteed a life free from official thieving (freelance thieves are dealt with most firmly by the guild). You can read the Discworld books in almost any order. Some of them run in little trilogies that follow the same characters, but even if you picked up the second or third volume of these, you’d probably get along OK — Pratchett is quite good at getting newcomers to Discworld up to speed on its basics. Thanks for the review Neerav. I read two or three of Terry Pratchett’s books (the first few in the Discworld series) last millenium and loved them, and not too sure why I didn’t continue. I think I’ll have to revisit this series. One of the forewords or precis of the discoworld novels I read had something like “this book doesn’t come with a map, but feel free to draw one yourself”. I had just re-read the Lord of the Ring trilogy, and loved that comment about maps! good review. can you tell me how can i purchase the book online?